Could you run a marathon in these shoes? 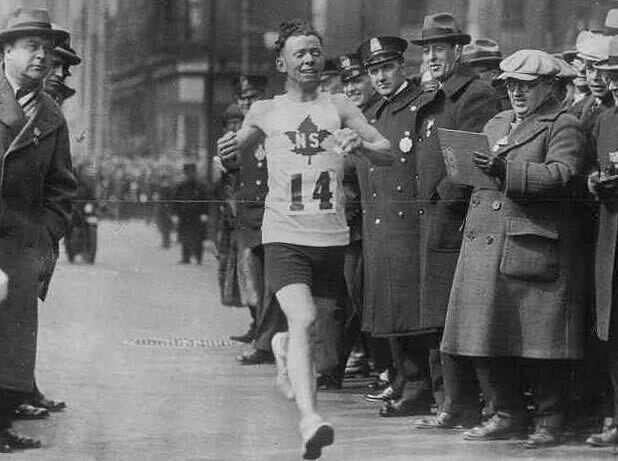 The Boston Athletic Association’s treasure trove of artifacts from the Boston Marathon includes shoes that were either worn in the race or represent the style of their era. Gloria Ratti, the BAA’s vice president and resident historian, shared this history of some of them. Patty (Lyons) Dillon, who was second in 1979, 1980, and 1981, found these shoes in Mystic, Conn., possibly at a thrift store. These were worn by Johnny Miles of Canada, who worked at the Sydney Mines Co-Op store in Nova Scotia and bought the shoes there. According to Ratti, Miles’s employment got him a discount of one cent, dropping the price to 99 cents. 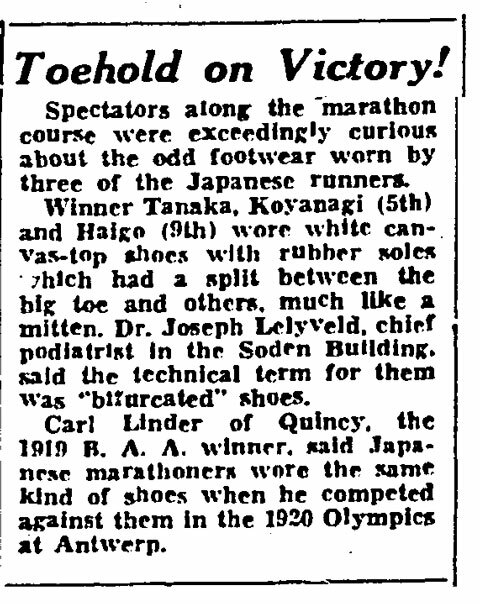 While they look somewhat like ordinary shoes, these were worn by Ted Vogel, a student at Tufts at the time who came in second. There is tar or asphalt on the bottoms of them. Japan’s Shigeki Tanaka wore this unique style en route to victory at the young age of 19. They are made from denim, and feature an interesting tread pattern. 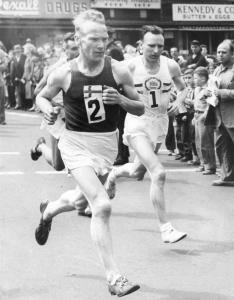 Finland’s Veikko Karvonen won the race by more than 2 minutes in these shoes. They were found in a men's room somewhere in Massachusetts, but no other details about how they were acquired are available. 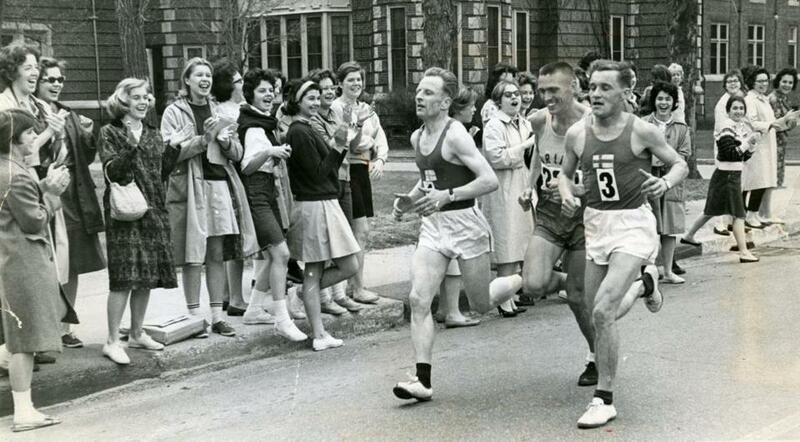 Veikko Karvonen of Finland (left) and Jim Peters of England during the 1954 Boston Marathon. 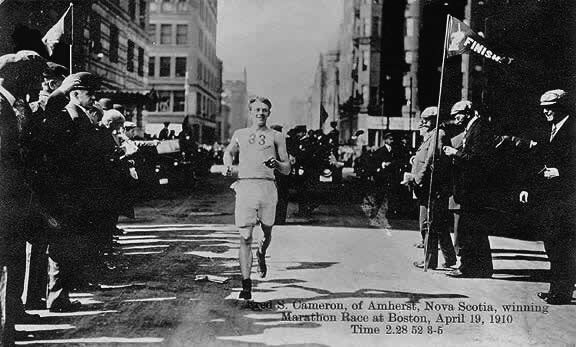 Eino Oksanen of Finland wore these in his victory by more than a minute over fellow Finn Paavo Pystynen. They are made of kangaroo leather. From left, Eino Oksanen, Marine Lieutenant Alex Breckenridge, and Paavo Pystynen passed by Wellesley College to the cheers of the students there. The identity of the runner who wore these Adidas shoes is unknown. 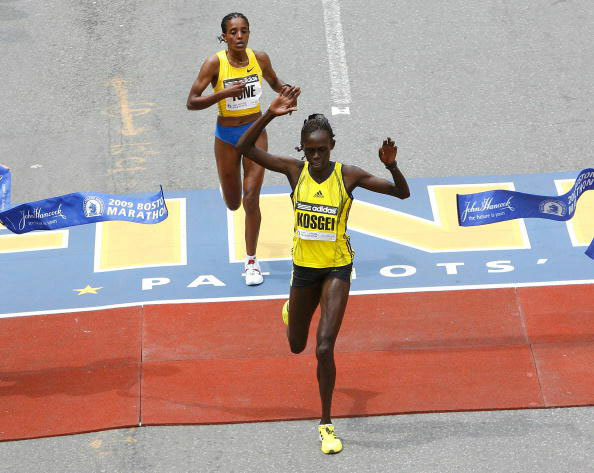 Salina Kosgei of Kenya wore this style of Adidas Adios shoes when she won by just one second.